"This is a world-class design and the kind of thing that we now see in other major cities around the world." 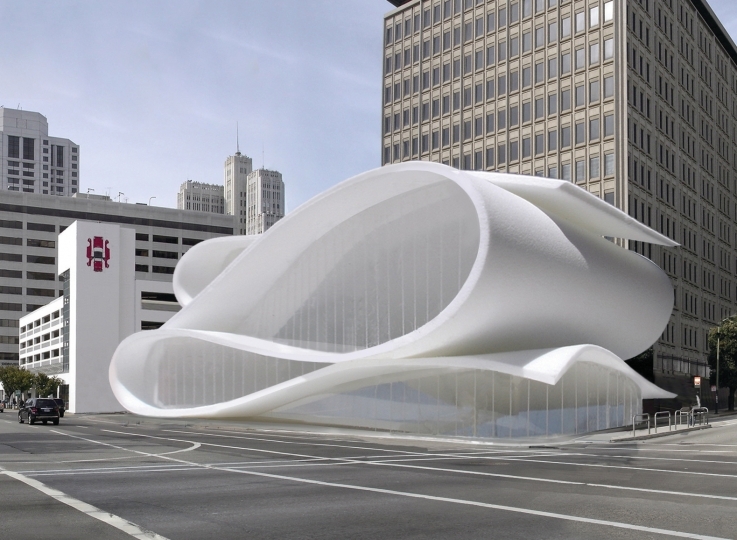 "San Francisco needs to build a big splashy Mark Dziewulski building to demonstrate to the world this city has a modern architectural soul." This is the first international arts institution devoted entirely to the performing arts and theatrical design. Set in the heart of the museum district of San Francisco, our objective was to create an iconic piece of architecture that reflects the institute’s stature as a world-class center for study. "I first met Misha [Baryshnikov] to discuss the project in a café opposite the Paris opera house, where he was rehearsing. I had been sketching ideas and we sat and talked about how we could express the meaning of the institute in an architectural form. My sketches were inspired by the movement and rhythm expressed in many of the performing arts – the flow of a series of dynamic movements. Misha started describing them with his hands in a fluid and expressive way. We started folding paper into the shape of the designs. Not only did the shapes begin to express the energy and tension that we wanted but they also reminded us of several other forms that are associated with performance, such as the swirling motion of dance, the curtains of a proscenium and the movement of a conductors baton, as well as the forms of sheet music and film. We were very excited that we had found an elegant yet pure form that could express in an abstract way the drama and energy of performance. We had several more meetings in New York at the Baryshnikov Institute, a new building of performance spaces that Misha and his team have designed." The building is intended to be a striking and architecturally significant, to provide a highly visible landmark that people will begin to identify with the museum. It is a serious and rigorous work of architecture but is also intended to be a playful and exciting design, crossing the boundaries of culture, education and age. At its best, architecture can be the universal language that can speak to all – a dynamic and sculptural design that can spark the imagination.